The fact is, Southport isn’t anywhere near as bad as I remembered. Every toilet in every chain restaurant seems papered over in posters warning about meow-meow and suggesting one ‘asks Frank’ but the expected gangs of feral tweens wandering the seaside wastelands seem to keep themselves voluntarily confined to a large skatepark. Tottenham and Hackney could learn a thing or two there. We’ve been here for three days, visiting my elderly relatives and taking a ride round ‘my old haunts’, as a obscure track by The Dream Syndicate might put it. There’s a decaying Victorian park sandwiched between an immense Travel Lodge and an even larger Best Western that offers a pleasantly melancholy tour of Southport’s former grandeur. 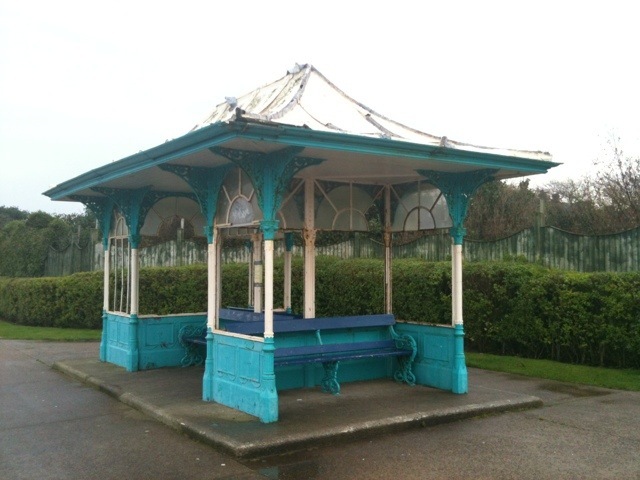 I had my iPhone so I took a picture of a decaying and pleasantly melancholy park gazebo (or meow-meow house). In the distance, there’s the deserted coils of the giant rollercoaster in Pleasureland. 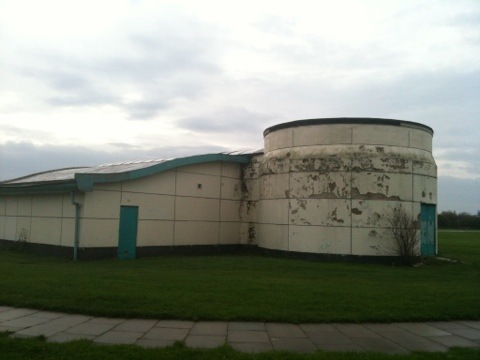 I’ve no idea if it opens in winter. Probably not. It looks like the council decided to put a lot of money into it at some point and sort of…stopped. 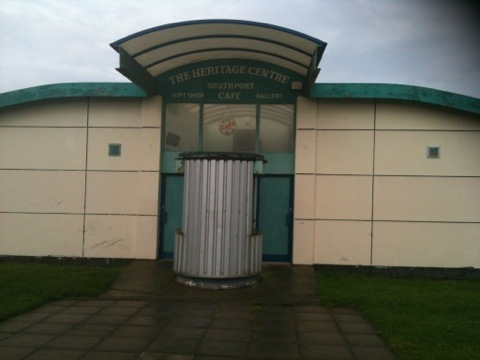 But not before they built a heritage centre. I walked around it (it was closed) and couldn’t really work out what it was for. It was surrounded by truncated lampost pillars, like a Greek ruin. There’s a circular chamber at the back. Perhaps its the airconditioning for a vast underground system of tunnels and bombshelters. Perhaps not. Dudelet and I took a walk while we waited for the arcades to open. 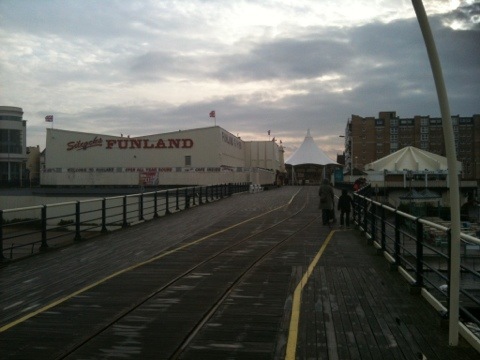 There are rituals associated with seaside towns which must be observed at all costs and the exchange of money for noise, coloured lights and unreliable hits of serotonin is one of them. Dudelet, though he didn’t know it at the time, was about to win a jackpot amount of tickets* and acquire a memory which will remain with him for the rest of his life. Meanwhile, we passed a building with a sign proclaiming it to be the Smallest Pub In Britain. 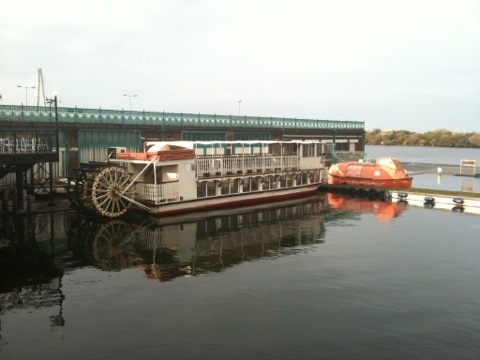 Next to the Smallest Pub In Britain was an equally small sternwheel paddle steamer. I have no idea how they acquired it. 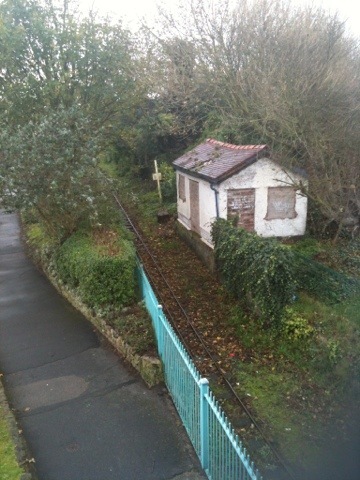 Back in the park, we found a deserted miniature railway station. It was a forlorn sight. 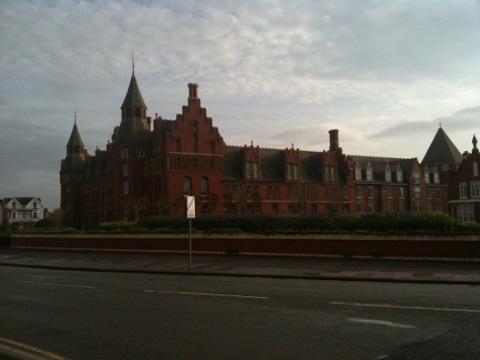 Elsewhere, the Most Gothic Hotel In Southport stood waiting R-PAT’s wedding party. Then I discovered Hipstamatic and turned everything into the 1960s. And here’s a picture of my family. They’re the cold looking little group trudging wearily towards Fun. Later this week, I’ll do the happy post about the joyous, uplifting things. But today is all about the cliché and the decay. I suppose I’m listening to too many Cure reissues. *If you don’t already know, it’s far too complicated to explain. 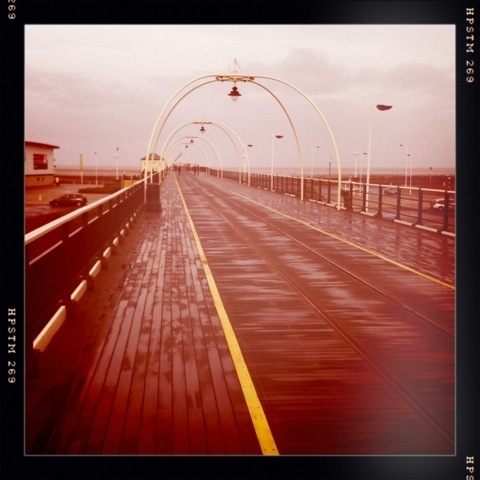 We are in Southport for a few days so posts may be sporadic. 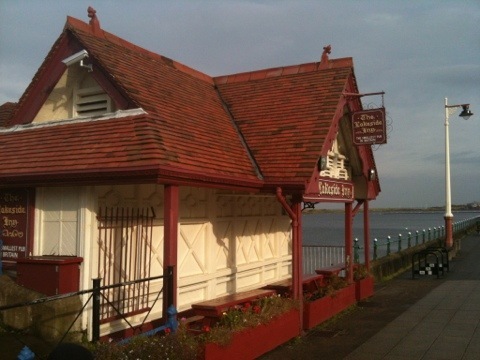 It isn’t my favourite place for many complicated reasons but at the far end of the pier is a penny arcade. 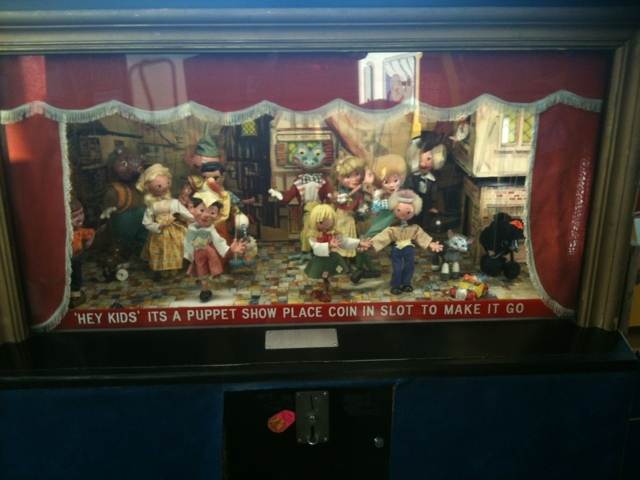 You change modern ten pence pieces into old pennies and travel back to a far more innocent time. Apart from the machine with the pictures of Japanese pearl divers.